This morning the nation grieves after hearing last night of the loss of Beau Biden, 46, a rising political star and gubernatorial hopeful in Delaware and the eldest son of Vice President Joe Biden, after a battle with brain cancer, a tragedy that seems graver and more heartbreaking in the face of the multiple familial losses the Vice President has had to endure over the years. Biden's first wife, Neilia, and young daughter were killed in a 1972 car accident and the three remaining family members survived. 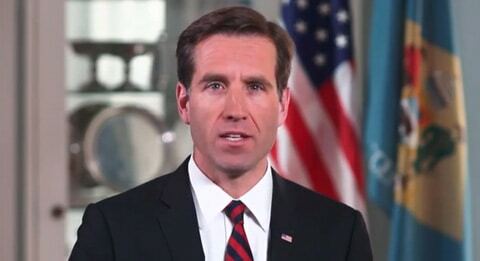 Beau Biden was also a champion for LGBT equality, declaring in a 2013 video: "All Delawareans should be able to marry the person they love, the person who they want to spend their life with. The freedom to marry is the fundamental, defining civil rights issue of our time." In a video made shortly thereafter, Biden urged state lawmakers to pass legal protections based on gender identity: "I support providing protections from violence and discrimination based on gender identity and expression under Delaware law. I will work with our General Assembly to pass legislation that will provide such protections this year." Towleroad sends its thoughts to the Biden family as well as all those grieving this terrible loss.